in the United States. There are over 1 million men and women who die each year of heart disease. February 10th, the Police Department responded to 954 calls forservice, of which 120 required formal investigations. The followingis a summary report of the major incidents handled by theDepartment during this period. suspects were arrested and transported to the Arcadia City Jailfor booking. At about 9:20 p.m., officers were dispatched to the 800 blockof West Huntington Drive regarding a domestic dispute. Afemale was heard yelling and seen pulling away from a malesubject. An investigation revealed the couple began arguing afterleaving a Super Bowl party. The male subject slapped the femalesubject across her face. The 36-year-old male from Los Angeleswas arrested and transported to the Arcadia City Jail for booking. 23-year-old male from Pasadena was arrested and transportedto the Arcadia City Jail for booking. Just after 9:55 p.m., an officer responded to a residence in the700 block of Anoakia Lane regarding a burglary. An investigationrevealed two male suspects entered the back yard. One suspectfound a ladder and climbed up to the second story balcony. Hethen smashed the master bedroom sliding door and entered thehome. The victim arrived home at that time and the suspects fledthe scene. The investigation is ongoing. At approximately 3:22 p.m., an officer was dispatched to aresidence in the 400 block of Stanford Drive regarding a burglary. An investigation revealed unknown suspect(s) entered the homeby unknown means, possibly an unlocked sliding door, stole awatch and fled undetected. No witnesses were located. Just before 7:00 p.m., an officer conducted a traffic stop on avehicle in the area of Baldwin Avenue and Arboretum Way forhaving expired registration tabs. Upon contacting the driver, theofficer discovered the 32-year-old male from Los Angeles wasdriving without a license. He was cited and released in the field. The vehicle was left legally parked. McKee DMD Dentistry, 145 East Duarte Road, regarding aburglary alarm activation. An investigation revealed unknownsuspect(s) smashed a ground floor window causing the audiblealarm to sound. The suspect(s) fled the scene. The investigationis ongoing. At approximately 5:35 p.m., an officer was dispatched to Mrs.
Fields Cookies, 400 South Baldwin Avenue, regarding a theft ofa purse. An investigation revealed an unknown suspect stole anemployee’s purse from behind the main counter and fled thescene undetected. The investigation is ongoing. the officer determined the 24-year-old male from Temple Citywas driving under the influence of an alcoholic beverage. Thesuspect was arrested and transported to the Arcadia City Jail forbooking. At approximately 10:50 p.m., an officer conducted a trafficstop on a vehicle in the area of Live Oak Avenue and TenthAvenue for making an illegal U-turn. Upon contacting thedriver, the officer noticed a strong smell of marijuana emittingfrom the driver. The driver indicated he was in possession ofmarijuana. Further investigation revealed the driver was drivingwith an expired license and was on probation. Arcadia Police K-9Zoli detected the odor of illegal drugs coming from a backpackcontaining $20,000 in cash. The 43-year-old male from BeverlyHills was arrested and transported to the Arcadia City Jail forbooking. regarding a vehicle burglary report. An investigation revealedan unknown suspect smashed the right rear passenger windowof the victim’s vehicle and stole a laptop from the back seat. Nosuspects were seen and no witnesses were located. the driver was driving with an expired license and without amotorcycle endorsement. The motorcycle also had expiredregistration and the driver was on probation for narcotics. Theofficer located PCP on the subject. The 61-year-old male fromPasadena was arrested and transported to the Arcadia City Jailfor booking. ripped the alarm system from the wall and stole a computer. Theinvestigation is ongoing. Just before 1:00 p.m., officers responded to the 300 block ofDiamond Avenue regarding a robbery that had just occurred. The victim stated the suspect approached him, pointed a gun athim and demanded his property. The victim gave the suspect hiswallet and cellphone. The suspect ran to an awaiting vehicle andfled the scene south on Second Avenue. handgun. The suspect vehicle is described as an oldermodel blue Honda Civic sedan. 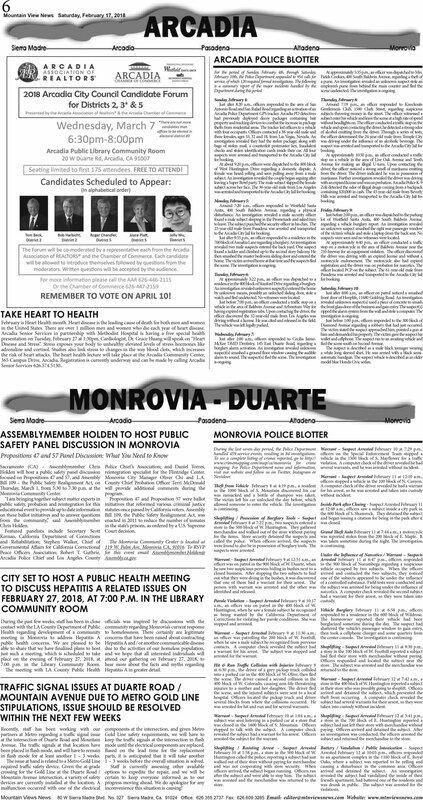 Sacramento (CA) – Assemblymember ChrisHolden will host a public safety panel discussionfocused on Propositions 47 and 57, and AssemblyBill 109 – the Public Safety Realignment Act, onThursday, March 1, from 5:30 to 7:30 p.m. at theMonrovia Community Center. “I am bringing together subject matter experts inpublic safety, probation and reintegration for thiseducational event to provide up to date informationon these ballot initiatives and to answer questionsfrom the community,” said AssemblymemberChris Holden. reintegration specialist for the Flintridge Center. Monrovia City Manager Oliver Chi and L.A.
in the state’s prisons, as ordered by a U.S. SupremeCourt decision. 7:00 p.m. in the Library Community Room. hear more about the facts and myths regardingThe meeting with LA County Public Health Hepatitis A in greater detail. Recently, staff has been working with ourcomponents at the intersection, and given Metropartners at Metro regarding a traffic signal issueGold Line safety requirements, we will have toat the intersection of Duarte Road and Mountain keep the traffic signals at the intersection in flashAvenue. The traffic signals at that location havemode until the electrical components are replaced. The issue at hand is related to a Metro Gold Line 1 – 3 weeks before the overall situation is solved. crossing for the Gold Line at the Duarte Road /options to expedite the repair, and we will beMountain Avenue intersection, a variety of safetycertain to keep everyone informed as to ourdevices are currently installed at the location. Aprogress moving ahead. We do apologize for anymalfunction occurred with one of the electrical inconvenience this situation is causing! During the last seven-day period, the Police Departmenthandled 459 service events, resulting in 84 investigations. visit our website and follow us on Twitter, Instagram orNextdoor. was ransacked and a bottle of shampoo was taken. The victim left his car unlocked the day before, whichallowed someone to enter the vehicle. The investigationis continuing. person with warrant was arrested and the other wasidentified and released. Parole Violation – Suspect Arrested February 9 at 10:17a.m., an officer was on patrol in the 400 block of W.
was arrested for hit and run and for several warrants. arrested the subject for the warrant. February 10 at 1:58 p.m., a store in the 500 block of W.
officers on the Special Enforcement Team stopped avehicle in the 1300 block of S. Mayflower for a trafficviolation. A computer check of the driver revealed he hadseveral warrants, and he was arrested without incident. officers stopped a vehicle in the 100 block of N. Canyon. A computer check of the driver revealed he had a warrantfor his arrest, so he was arrested and taken into custodywithout incident. Inside Park after Closing – Suspect Arrested February 11at 12:48 a.m., officers saw a subject inside a city park inthe 600 block of S. Shamrock. They detained the subjectand began issuing a citation for being in the park after itwas closed. was taken sometime during the night. The investigationis continuing. the subject was arrested for being under the influence ofnarcotics. A computer check revealed the second subjecthad a warrant for their arrest, so they were taken intocustody. Vehicle Burglary February 11 at 6:58 p.m., officersresponded to a residence in the 600 block of Wildrose. then took a cellphone charger and some quarters fromthe center console. The investigation is continuing. a store in the 100 block of W. Foothill reported a subjecthad fled their store with merchandise without paying. store. The subject was arrested and the merchandise wasreturned to the store. Warrant – Suspect Arrested February 12 at 7:42 a.m., astore in the 400 block of W. Huntington reported a subjectin their store who was possibly going to shoplift. Officersarrived and detained the subject, which prevented thetheft from occurring. A computer check revealed thesubject had several warrants for their arrest, so they weretaken into custody without incident. an investigation was conducted, the officers arrested thesubject and returned the merchandise to the store.